bear’s 5th birthday :: the loot bags. truth be told, i kinda loath the whole loot bag idea, but it is what it is and i have to work with the system. in years passed, we have made some kind of non-edible gift for our friends to take home. we’ve sent our friends and family home with magnets, bow ties, pinwheels and one year the kids just got a balloon! this year, since bear is in school and the kids have learned to expect a certain amount of candy and junk, i just caved and gave them what they wanted. i got each kid a helium balloon, a few dollar store items like foam animal masks and funny monkey buttons and glow sticks. 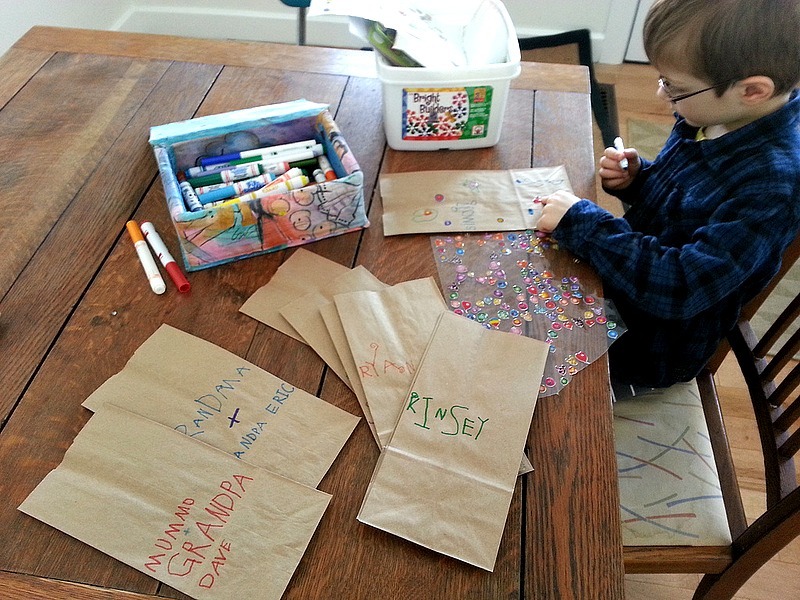 then we made a yummy sweet n’ salty treat bag for the kids to take home. we took normal lunch paper bags and bear decorated one bag per guest. he worked so hard writing everyone’s names on them and decorating them with party themed drawings. i attached the paper treat bags to the plastic loot bags and the kids were thrilled! unfortunately i didn’t get a pictures of all the final bags, but you get the idea. so simple, quick and easy, and a fantastic way to get the kids involved! what do you about loot bags? do you nix them or hand them out? tomorrow i will post about bear’s fantastic cake! TOTALLY pinned this! Thanks for sharing this at Whimsy Wednesday. Having you at the party with us makes it so special! well, thanks for hosting kelly! you guys always have great people joining the fun! and, BTW, thanks for pinning! I really loath loot bags too. I opted for a bottle of bubbles and a gift card for $2 to our local frozen yoghurt store. Parents all loved it and so did the kids. No tiny things to get lost and strewn around the house! 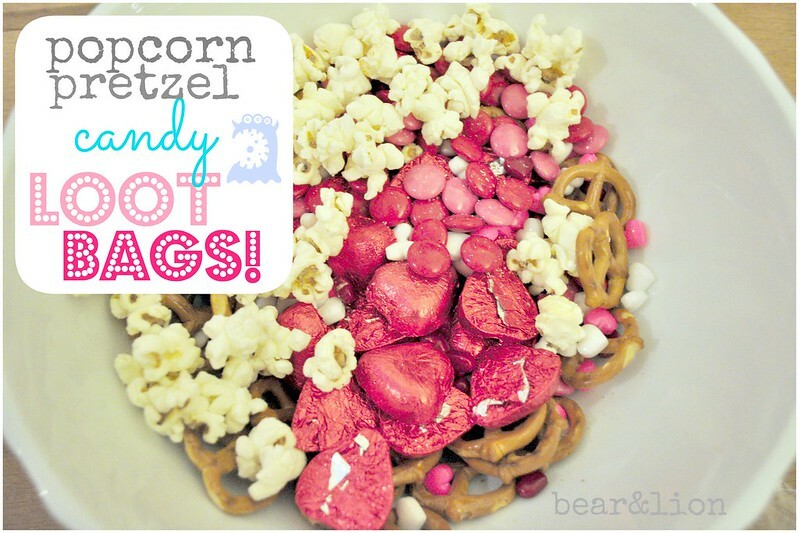 I love the mix of popcorn and pretzels. Edible is the way to go! Thanks for the inspiration! thanks for sharing, johanna. i love the gift card idea, i think i’ll try to remember that for next year. i’m not super keen on the treats either, but it is what it is!